World War Two has shattered Valka's homeland of Russia, and Valka is determined to help the effort. She knows her skills as a pilot rival the best of the men, so when an all-female aviation group forms, Valka is the first to sign up. Flying has always meant freedom and exhilaration for Valka, but dropping bombs on German soldiers from a fragile canvas biplane is no joyride. The war is taking its toll on everyone, including the boy Valka grew up with, who is fighting for his life on the front lines. As the war intensifies and those around her fall, Valka must decide how much she is willing to risk to defend the skies she once called home. Inspired by the true story of the airwomen the Nazis called Night Witches, Gwen C. Katz weaves a tale of strength and sacrifice, learning to fight for yourself, and the perils of a world at war. World War II is still a really popular topic, and I'm always looking for books on different facets of it. Riordan's The Sniper covers women in the Russian military, but I didn't know how much more involved Russian women were in the air force. There are many more books about the army aspect of the war, and not as much about the air battles, so this had several things to recommend it. The light romance was a great touch to get readers who are not tremendously interested in the military or history to pick up the book. The details of daily life at the time were quite good, and I especially enjoyed reading how Valk idolizes some of the women pilots and is given the opportunity to have flight instruction. This might surprise some young readers. Pair this with Lasky's Night Witches, Davis' Mare's War and Lynch's WWII series. 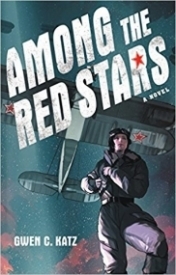 Among the Red Stars is one of the best books I have read this year. It’s a riveting, touching story that will stay with readers a long time. Please do yourselves a favour and get your hands on a copy of this book the moment it’s released. You’ll thank me for it. I love the book so much that even though I received a free copy of it, I’ve already preordered a finished copy! If that doesn’t tell you how good this book is, I don’t know what else will. I also had the privilege of interviewing the author.